Exceptional grass growth thanks to an unseasonably warm start to spring has allowed many farmers to take their first cut of silage. First silage cut at Keythorpe Lakes Farm, Tugby. 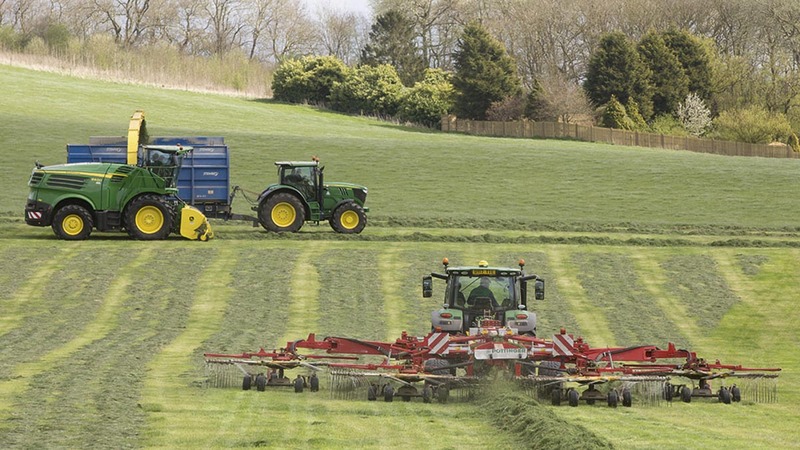 Organic dairy farmer Will Armitage, who runs a 350-strong herd in Tugby, Leicestershire, started mowing on Monday (April 10), six weeks earlier than usual. He said: “We had phenomenal grass growth in the last two to three weeks and it got to a point where grass got ahead of cows. “It was growing so fast we had to take the silage out of the way and bank it otherwise we would not be prepared for the cows to graze in three and a half weeks’ time. Mr Armitage said he expected the early silage was down to ‘exceptional weather’ over the past few weeks but urged if the grass was available it should be banked. A dry spell approaching could cause a stump in silage stores until May time, he said. “We foraged 26 ha (65 acres) yesterday,” Mr Armitage added. “We got to 3,800 kilograms of cover, which is dry matter per hectare, but that is far too much cover for cows to graze on – they can just about cope with around 3,100 kilos.